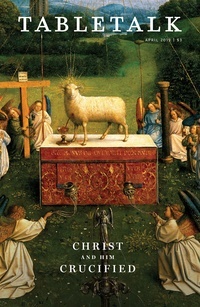 The April 2019 issue of Tabletalk will address what it means to know “Christ and him crucified” (1 Cor. 2:2). Christians are people of the cross, as the atoning work of Christ on Calvary is at the very center of our faith. However, while believers are aware that Jesus died for sinners, many Christians do not have a full-orbed understanding of the work of Christ, what it accomplished, for whom it was offered, its place in the history of redemption, and how it applies practically to their everyday lives. This issue of Tabletalk will seek to help believers better understand the core elements of their faith, serving as a primer of sorts on our Lord’s redemptive work and all that it has accomplished. In so doing, it will also answer common misconceptions and misunderstandings regarding various aspects of the work of Christ. Contributors include Guy Prentiss Waters, Gregory K. Beale, L. Michael Morales, D. Blair Smith, Ryan McGraw, David B. Garner, Eric Hausler, Roland S. Barnes, Jared C. Wilson, Lee Webb, and David E. Briones.